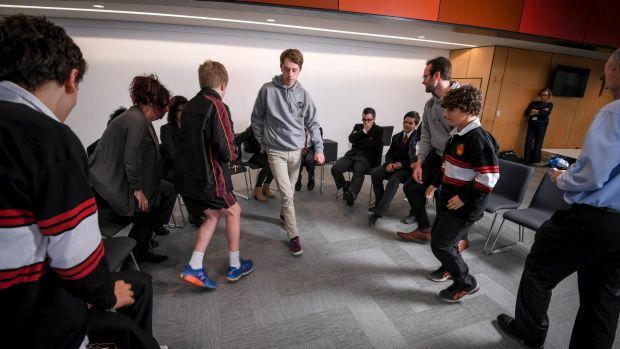 In a brightly lit space in one of the school's newer buildings a group of teenage boys is sitting in a rough circle playing a get-to-know you game that's a mix of musical chairs and guess who. There's the usual jokey exchanges and awkward adolescent shuffling, but nothing that sets this group apart from the norm. In fact, the boys gathered together before the bell starts the day at St James College, Bentleigh, are all in some way or other, outside the main crowd. Calling themselves St James' Finest, the boys, aged 12 to 15 are all diagnosed autistic. Many have faced huge struggles over their school years to fit in socially and to learn well in class. But in this group, everyone fits in. St James Finest is one of about 35 groups running in primary and secondary schools across Victoria, Queensland and Tasmania, with groups planned soon for New South Wales. In primary schools, the groups are called Imagination Clubs. Many of the students involved either haven't been told or don't yet want to tell others that they have an autism diagnosis. In high schools, the members all know they have autism and one of the group's main goals is to raise awareness of the disorder in their school community. The older clubs also get to name themselves, a group in Ringwood proudly dubbed themselves The Mutants. When St James' Finest get together each fortnight, a regular part of their sessions is one of the members presenting to the group about their experience of being autistic. The boys talk about things like their challenges they have faced over their years at school, the kind of support that helps and what quirks or intense interests they may have. One 14-year-old revealed he was obsessed with 1980s comedy, another shared his encyclopaedic knowledge of the Whitlam dismissal and another his fascination with number stations, coded shortwave radio broadcasts first used in World War I. 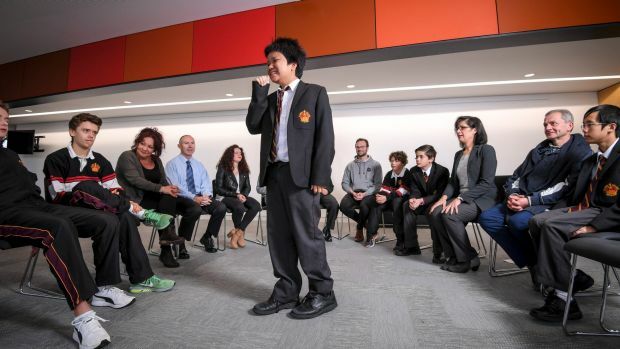 The school-based groups were set up by the I Can Network, a social enterprise founded by a handful of young adults with autism who wanted to give other kids what they had mostly missed out on over their school years: social connections, self-confidence, acceptance and pride in their autistic condition. In 2013, chief executive Chris Varney started the network after he was overwhelmed by the response to his stirring Ted talk, "Autism: how my unstoppable mother proved the experts wrong". Varney says that while understanding of autism has improved enormously in recent years, there are still clear gaps in how much most schools actively support students, particularly in areas such as social skills and communication. As part of the program, Varney addresses the whole school at the start of each year, as he describes it, "trying to engineer a re-think about autism". "For the wider school community, autism is just another label and one they may not have a deeper understanding of . It's so important to influence this generation about autism so that these guys don't grow up with the same sort of negative stereotypes and experiences that earlier generations of autistics have had." 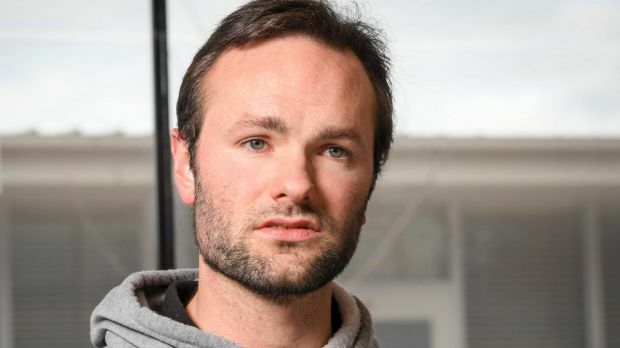 Varney describes it as distressing that up to 60 per cent of adults with autism are unemployed and says he is overwhelmed by calls and emails from people who have only been diagnosed later in life and are struggling. "There is so much more awareness now and early intervention in primary schools. In secondary schools it's getting better, but after that, in TAFE and other tertiary learning, there is a huge need." Autistic pride is one of the key goals of the schools program, along with self-acceptance, confidence and optimism. I Can also runs twice yearly camps and has begun working with businesses aiming to improve their understanding and support for employees and clients with autism. Mary Rainsford, the student services leader at St James, sought out I Can after hearing Varney speak at a local schools meeting. She says out of about 35 kids with disability funding at the boys-only, year 7 to 10 school, more than half have an autism diagnosis. Ms Rainsford gets a lot of calls from parents asking about enrolment at the school who talk about their sons struggling to make friends in primary school. "The group brings all these young men together. They didn't even know there were so many of them. Of course they are all different but they understand and support each other." One of Ms Rainsford's happiest memories of the group is the year 10 boy who stood up, nearly in tears, to say, "oh my god, you get me". She says the growing confidence she sees in the boys of St James Finest is spilling over into the classroom and leading to positive changes in their learning and behaviour. I Can also runs professional development with staff and she says this has helped to make the school's approach to supporting students with autism genuinely uniform. "It opens up a lot of professional conversations. In the classrooms we allow a lot of different strategies and we're quite flexible, we understand things can be done in different ways." Since I Can started working with the school two years ago, St James has also become a lot more open about autism. There is a regular item in the newsletter that describes what the group has been doing and highlights other relevant news. Varney says another key achievement of the group is that it uses the older students, who have done more than a year of the program, as mentors to the newer members. "A lot of these kids have never had the regular leadership positions. They don't get the badges on their jumpers, they're not called on to speak at assembly. This is a way of giving them that leadership experience and you see the change that can bring."